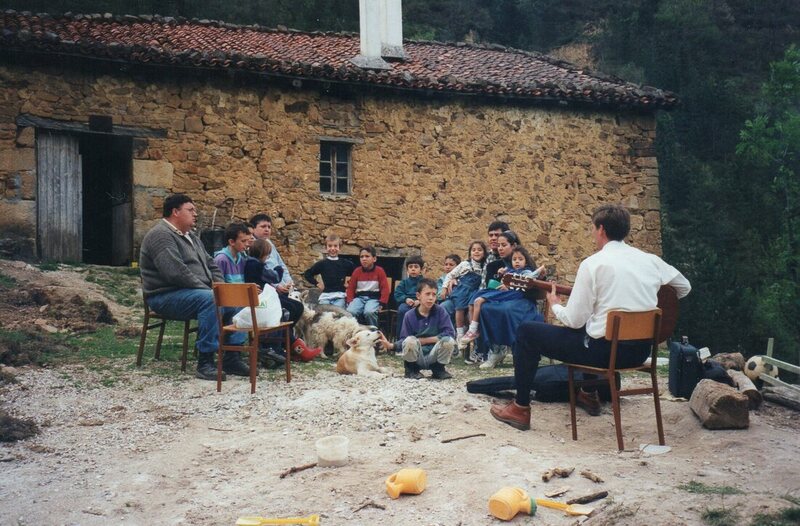 The "Aierdi Miracle" is what we call the wonderful story of God’s providence through which He gave us the rustic old Aierdi farmhouse in the Basque region of northern Spain. It all began when in 1998 the Lord led us into a prayer project called “Count the Stars”, based on the promise He gave to Abraham in Genesis 15:5. Today we are in the faith-challenging adventure of rebuilding the centuries-old farmhouse and adapting it for all kinds of ministries. With the help of many churches and friends, it is slowly being transformed into a retreat & conference. Although far from finished, we already use it to host church activities, youth programs, intensive institutes, retreats, and mission teams throughout the year. As we look back and remember the many months of prayer and waiting, with nothing to stand on but the promise of God and the stars to remind us of His faithfulness, we praise and worship Him for His wisdom. Glory to God! The stars still shine as sparkling witnesses of His infinite faithfulness and power. In 19 years much has changed. We had no idea what God would do. Lord willing, this week we will have our first ever Apologetics retreat, with about 35 believers. In 2019 God's farmhouse will host three intensive institutes, two youth mission teams, several province church fellowships, a Christian workers retreat, the 16th Missionary Teen Retreat, and a few other activities. We are a group of independent Baptist church planting missionaries in the Basque region of Spain. The team started in 1997 when the Lord directed the Alvarez family to work with the Bonikowskys in the Goierri towns of Gipuzkoa. Through the years other families and individuals have joined. Some have stayed nearby while others have set their sights on one of the many needy communities within an hour's drive. We have never had a written contract. Our bond is simply the fact that our Lord Jesus Christ has led us to combine talents, personalities, and energies to preach the Gospel in the area. We all appreciate the value of the unique Aierdi farmhouse in the development of our national leadership and in the hosting of mission teams from our supporting churches in the USA. Each of us helps in the variety of ministry activities we program at Aierdi, including local church fellowships, intensive Bible institutes, youth retreats, missionary teen retreats, and the hosting of mission teams that come to work on the ongoing reconstruction and development of the facilities. At this time our team is made up of five families: Andy & Mimi Bonikowsky; Juan & Tete Alvarez, and their daughter, Andrea; Mike & Madelaine Dodgens; Danny & Jordan Bonikowsky, with baby Clara; David & Jennifer Willis, Charissa, Danae, Gloria, and Seth.